A community is in mourning after police say a Delaware father killed his wife and children before taking his own life. A friend of the victim is now speaking out. A man who a neighbor says spoke of marital problems and a recent job loss shot his wife and the three young children before turning the gun on himself inside their home in a quiet Delaware community, authorities say. Matthew Edwards, 42, killed himself Monday night after gunning down his 41-year-old wife Julie and their children, Brinley, Jacob and Paxton, Delaware State Police said Tuesday afternoon. The children ranged in age from 3 to 6 years old. Troopers found the gunshot victims on the second floor of a home on Ferris Road in Prices Corner, New Castle County, shortly before 8 p.m. Monday, police said. "With a heavy heart, our thoughts and prayers are with this family," Delaware State Police Sgt. Richard Bratz said. Children's toys, including a slide and kiddie pool, are on the lawn outside the home. 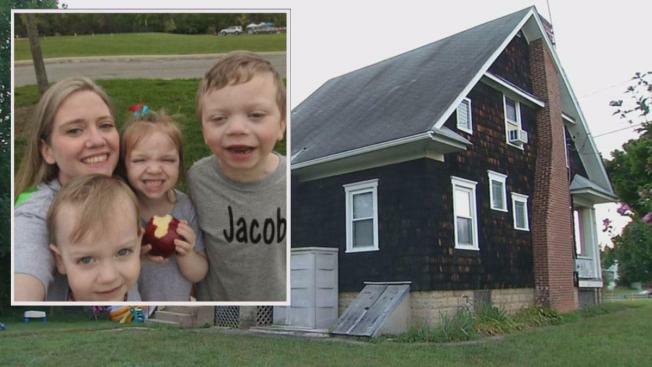 A neighbor told NBC10 his children played with the Edwards children. "There's three kids in there, wife and husband," Brian Covenko told NBC10. "Kind of in shock as we're really friends with them." Neighbors said Matthew Edwards would also play outside with his children when he was home. One neighbor, who asked not to be identified, said he just saw the children playing outside over the weekend. He said Matthew Edwards, who worked out of town, told him he recently had lost his job and was having marital problems. Julie Edwards advocated for the Williams Syndrome Association in social media posts. Williams Syndrome is a developmental disorder that can include moderate intellectual disability or learning problems and cardiovascular problems, according to the National Institutes of Health. Authorities haven't given word on what caused the shooting. "There is no concern for the safety of the surrounding area," police said. Anyone with information is asked to call detectives at (302) 365-8441. If you or someone you know is experiencing thoughts of suicide, call the National Suicide Prevention Hotline at 800-273-8255.